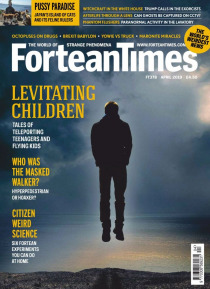 Fortean Times, named after maverick American writer Charles Fort, is one of the world’s most individual and best loved magazines. For over 35 years FT has been chronicling the stranger side of life, delivering a heady mix of weird world news, up-to-date reports and features on every aspect of the unexplained: myths, monsters, ghosts and UFOs rub shoulders with ancient wonders and future science,… while expert columnists bring you the latest on everything from cryptozoology to conspiracy theory. Open-minded, well informed and maintaining a healthy sense of humour, FT is the only place to go for a sensible look at our mad planet – it will change the way you see the world.